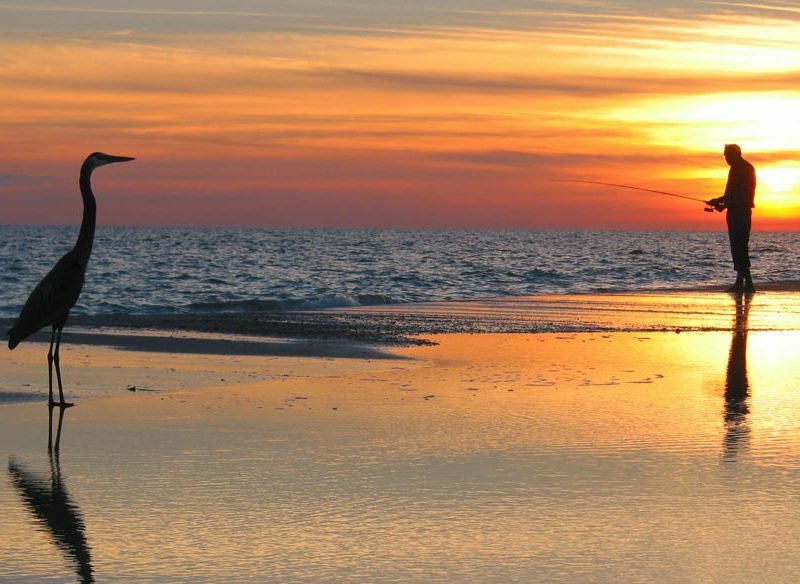 Nothing more peaceful than casting a line on the beach at sunset. Darwin. Country singer Slim Dusty’s claim that “a bad day’s fishing beats a good day’s work every time” rings true in the Top End. A hungry barramundi nudges your lure, sending a shiver of excitement up the line. Then it strikes, gulping the prey into its cavernous mouth. A mighty battle ensues – one that you hope will end with a barra in the net and, of course, the vaunted trophy photo. There’s nothing quite as thrilling as fishing for barramundi in the wild and nowhere for it that offers such diverse and magnificent settings as the Northern Territory. So here are a few tips on where and how to do it. Few experiences rival the feeling of gliding through the peaceful and picturesque billabongs of Kakadu National Park, checking out the crocs and birdlife, and hooking onto a barra or two. Book a room at Cooinda Lodge and hire a fishing guide for easy access to the beautiful Yellow Water Billabong, where you can troll a lure (a hard plastic bait) or flick a soft plastic into the waterlilies at dawn or dusk, and laze by the hotel pool in the heat of the day. There are plenty of land-based fishing spots on Darwin Harbour that are within cooee of the main street. Get the local lowdown from Ron and George at Fishing and Outdoor World. Grab a light spinning rod and a few lures and cast a line over rocky ledges for barramundi and queenfish all year round, or from gravelly beaches for whiting in the dry season. Drop a cooked-prawn-baited line off Stokes Hill Wharf for the chance of mackerel, golden trevally, queenfish or even a tuna. Fishing rod in one hand, beer in the other and a glorious sun setting over Darwin Harbour: bliss. 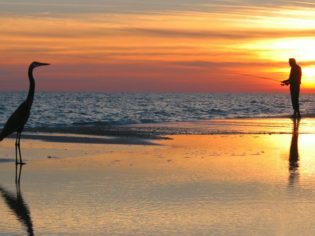 On the west coast of the Top End, about 90 minutes from Darwin, you’ll find access to bluewater fishing, mud crab-filled creeks and coastal rivers pumping bait and barra out of the floodplains at Dundee. A local fishing guide is a must around here to avoid the sandbars and find the right spots out wide to target sailfish. Head down the coast to the Finnis River for barramundi and monster jewfish, often stacked up on the same snags. Further south, the Peron Islands are a favoured habitat for all kinds of fish. And if you’re lucky you’ll get to hang out with humpback whale mothers and calves, which have been spotted off the coast in recent years. The Daly River is one of the Territory’s longest, most powerful and most alluring fishing destinations. It hosts several renowned fishing competitions and is a dry-season home for many grey nomads escaping the southern winter. Book into one of the riverside tourist parks and spend a couple of days exploring the river with a local guide to make the most of the diverse habitats, from freshwater gorges to coastal plains. Freshwater prawns (cherabin) fill the river in the dry season and make popular live bait. Soft plastic and deep-diving hard-bodied lures are the go during the ‘run-off’ at the end of the wet season (March-April) when the inland floodplains drain into the main river, bringing hordes of baitfish. The big barra are waiting for them and so are you. A 30-minute flight from Darwin takes you to the Tiwi Islands where ancient culture, art and incredible fishing collide. Around the top of the Tiwis, it’s permit-only fishing, up waterlily-lined inland rivers, along the coastal fringes and out into the bluewater. Barramundi, saratoga, threadfin salmon, golden trevally, queenfish and mangrove jack are just some of the species you can tick off your list as you explore one of the country’s most pristine environments. Book into one of the fishing lodges for an all-inclusive experience. Imagine landing on a barrage on the Mary River and throwing a lure into the best ‘run-off’ fishing waters pumping off the floodplains, or hitting up the dramatic red cliffs of the west coast, where tiny creeks shelter hungry barramundi making their way towards the sea. For the Top End’s most exhilarating fishing adventure, leave the 4WD at home. Heli-fishing tours can take you to far-flung locations, where you might even bag yourself a Million Dollar Fish.